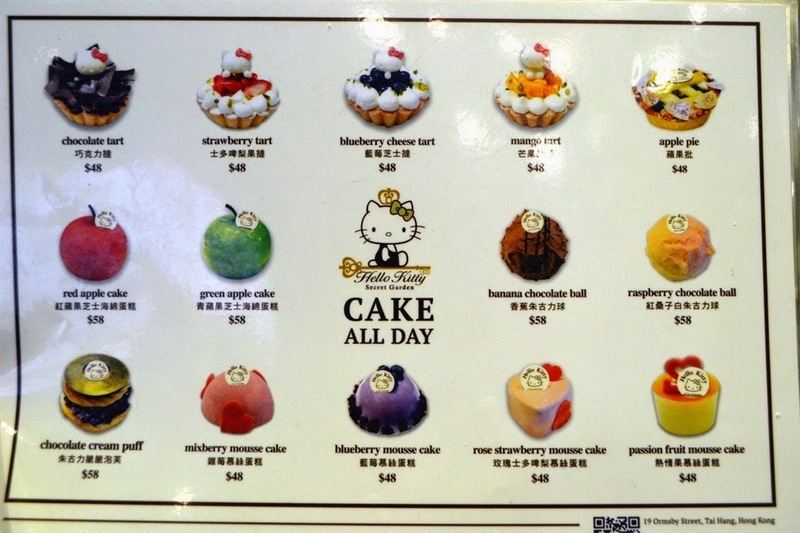 Hello Beautiful, I visited another Hello Kitty cafe and this time I fly all the way to Hong Kong. 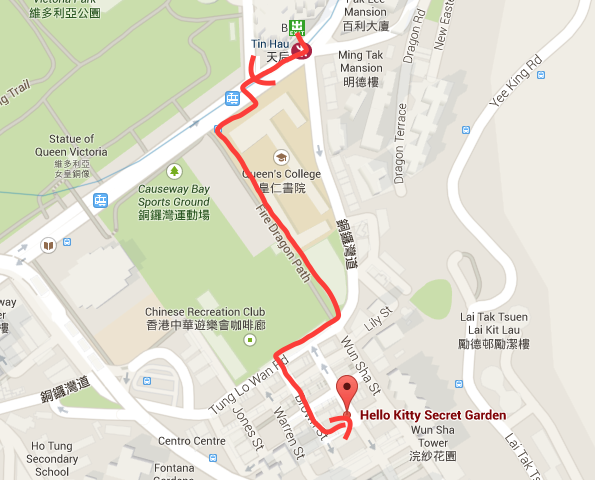 It is a small corner shop at Ormsby Street Tai Hang, I took Mtr and arrived at Tin Hau Station exit B and using my Maps Apps arrived in front of Hello Kitty Secret Garden. Inside this little cafe shop, there are 12seats available. So you have to wait for your turn if you are going to dine in. Each person will have 60 minutes to enjoy in the shop. 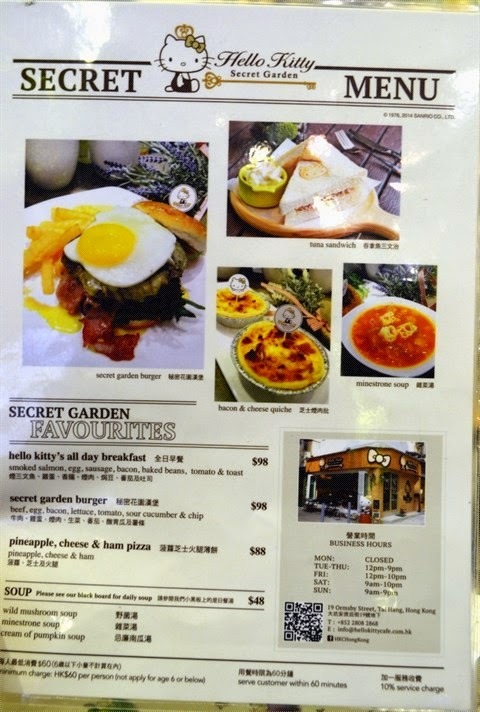 They serve Coffee, Tea, juices, cakes, breakfast set, burger, pizza and soups. And each person has a minimum spending of HK$60. I just had my breakfast before I came here so I just ordered their rose cafe latte and two pieces of cakes. I like the Red apple cake, it's a fluffy sponge cake covered with apple gelatin, it taste perfect with my cup of Rose latte. Another cake was the chocolate tart, I like the crunchiness of the tart and it's not too sweet. Location : G/F, 19 Ormsbay Street Tai Hang, Hong kong. There are 12 seats available, so you might need to wait for your turn. Each person will have 60 minutes to enjoy dining in. And the minimum charges per person would be Hk$60. I went to Hong kong with my boyfriend but he went back a day before me, so I have to go around Hong Kong by myself. I'm actually quite lost but I eventually arrived in front of the shop ( You don't have to worry because I draw the map for you in the information box). And I'm lucky that I have a seat right away, the waitress is friendly and helpful. She recommended me hot items in the shop. I kinda like the idea of travelling solo, maybe I can try it out next time. I'm thinking of Korea , what do you think ? Are you a Hello Kitty lover? Then you have to put this in your list if you are travelling to Hong Kong. If you are not a fan, you can visit this cafe becasue they served lovely cakes and delicious rose cafe latte. Stay tuned for another Hello kitty cafe blogpost.